We found this Parker and several Scheaffer pens in the shed. I think it has Parker Duo..something written on it. The design is light red and pearl grey marbling with black stripes. Can anyone tell me more about this pen, and also how to restore pens? We believe they belonged to my late father-in-law and possibly date around 1960s. 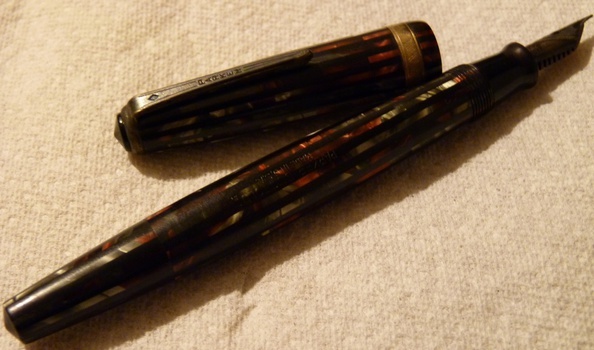 This is a Parker Duofold with Red and Grey stripped pattern. It was made in the 1940-1945 in USA. The filling system is vacumatic type, there is a blind cap in the back top that can be unscrewed to access a button. Pressing the button a few times will fill the pen of ink from a bottle. The pen would need probably cleaning of the internals and restoration of the filling system. Typically a new diaphragm is required. Google it and you will easily find people who can make a restoration or go to http://www.fountainpennetwork.com for more information about how to do it yourself. If it is your first restoration work I would not recommend to work on this pen, which is pretty nice and expensive. A restored Duofold like this can cost around 120-160 USA dollars.